President Trump vowed he'd never let the NRA down, and by choosing Judge Brett Kavanaugh, he chose someone whose judicial record demonstrates a dangerous view of the Second Amendment that elevates gun rights above public safety. We can't continue to let the NRA put its extremist agenda over the safety of our country. 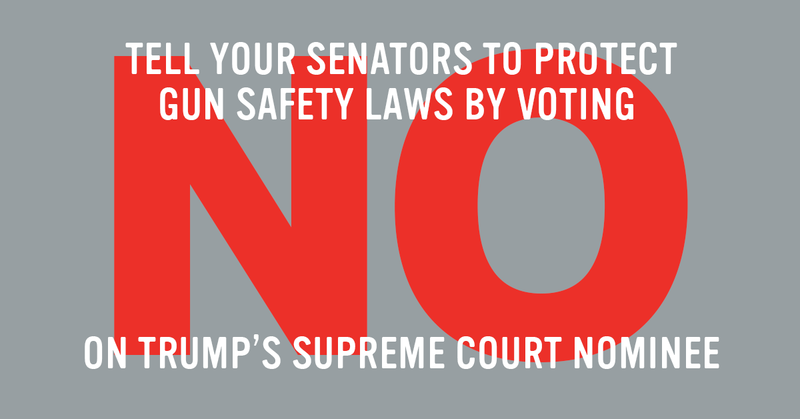 Use our tool to send a message to your senators and urge them to OPPOSE this nominee. President Trump's selection for the Supreme Court — Brett Kavanaugh — has dangerous implications for American communities across the country. Kavanaugh has an extreme view of the Second Amendment that puts gun rights above public safety and would jeopardize a wide range of commonsense laws related to firearms. It's critical that the next Supreme Court nominee has a commitment to preserving commonsense approaches to the Second Amendment that put people's lives ahead of extremism. For these reasons, please vote No on Brett Kavanaugh. I'm writing as a concerned American to urge you to OPPOSE Trump's Supreme Court nominee.